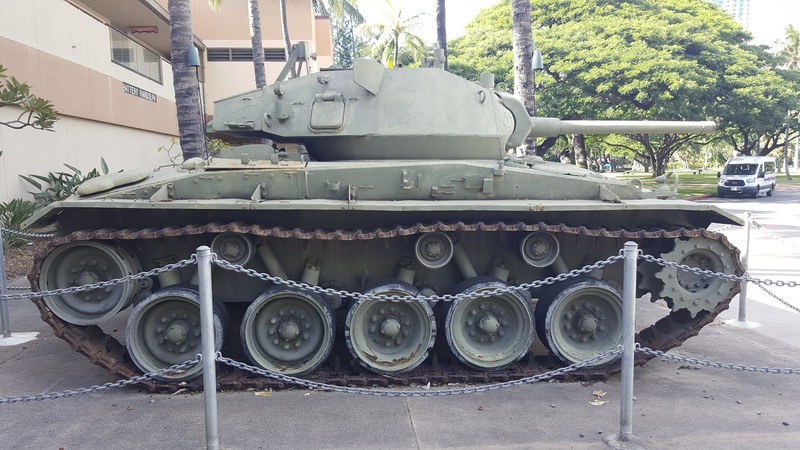 Day Two had me in downtown Honolulu, specifically around Waikiki. This jaunt was not for sun or surf; rather, to scout out my locale for one of the scenes in AIR. 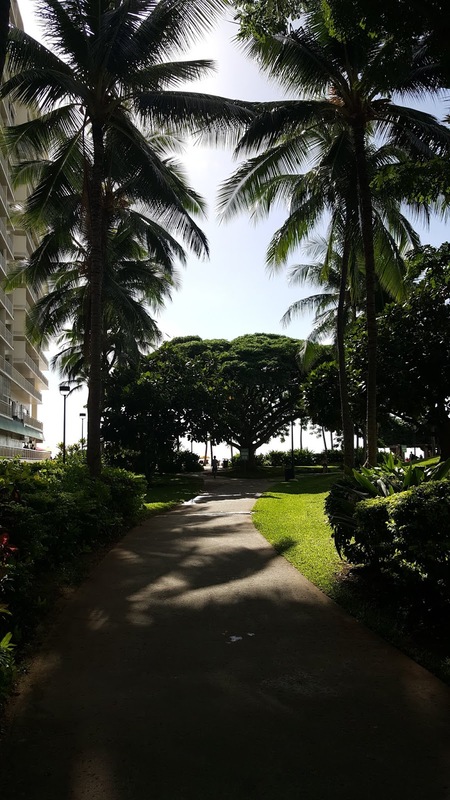 I arrived at Waikiki at the height of the sun, early afternoon on a Thursday, and the streets of this sardine-packed city were agog with tourists, tour buses, honking horns and general urban noise, so it took some focused imagination to see it through my sailors' eyes - late at night on their final Saturday Cinderella Leave before the attack. I had to envision far different clothes, lesser civilians, more army, more navy, the sights and sounds 77 years long gone from this world. 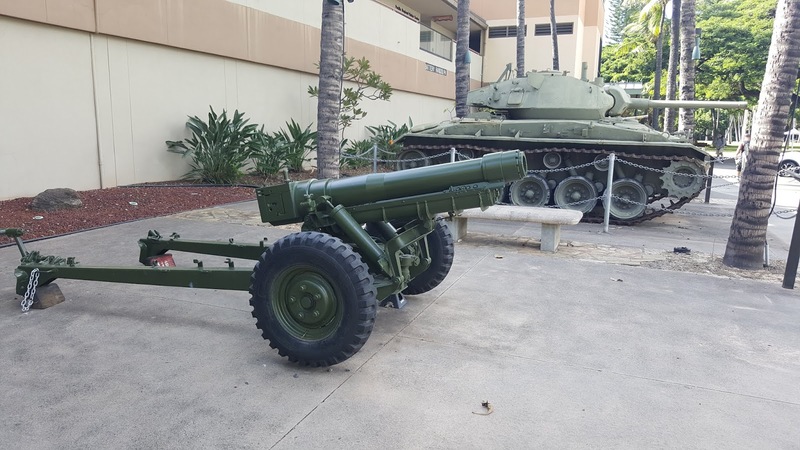 I crossed Kalia Road and approached the Fort DeRussy US Army Museum where I happened upon a few war relics from those days - a US pill box, a light tank and a howitzer. At the DeRussy Beach Park I sat for a while and allowed my eyes to be lead by my mind, and little by little, minute by minute, my vision grew foggy to the Now and crystallized to the Then, and sure enough down the street came my six sailor boys - in their late teens and 20s - and I watched them walk with a swagger and a sense of invincibility down to the beach. My eyes, my mind, my body followed as the real day turned into an imaginary night and time spun backwards. For me and for my boys, there was no doubt. It was around 10pm on Saturday December 6, 1941. 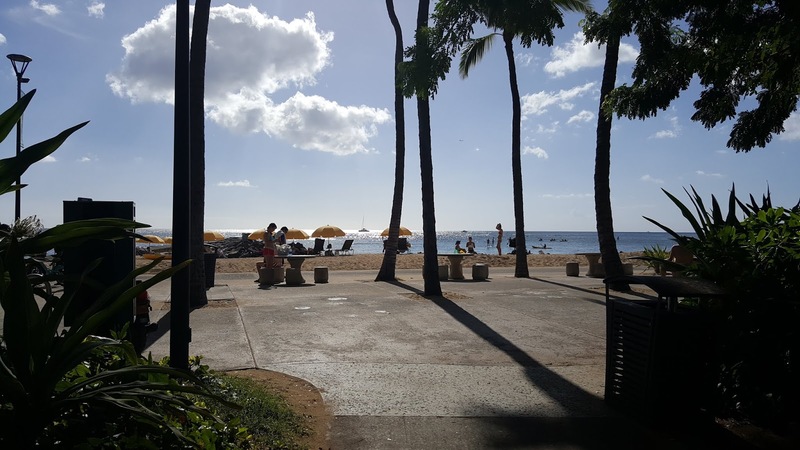 I knew where they were going and I went straight there, onto the narrow spit of beach where an ancient pier sat, across the boardwalk and onto Waikiki proper. 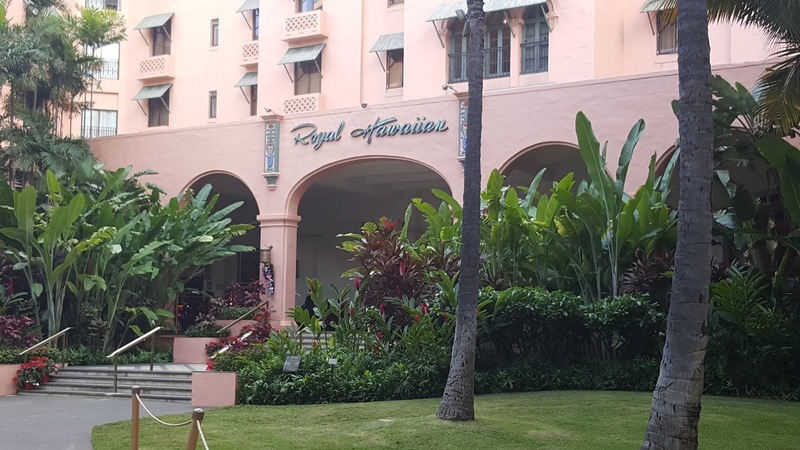 I swerved inland just slightly to walk into the luscious and verdant grounds of the age old Royal Hawaiian Hotel, only one of two such hotels in existence on Waikiki in '41. The Royal had always welcomed servicemen and women and today as I stood atop a neighbouring deck, two army men in fatigues casually walked into the hotel foyer. Whats the odds? I arrive and servicemen appear. Reality was mingling with fantasy. Entering the grounds, seeing that majestic entrance, the elegant foyer and closer to the soft sandy beach, the open air Monarch Room to the right and the Regency Ballroom to the left. My arrival into the past felt as if I were coming home, like I had been here all along. Sure, I looked like any other 21st century tourist wandering through the hotel but in my soul I knew I was not. Joy, warmth, friendship, loyalty, camaraderie - that is what I felt. 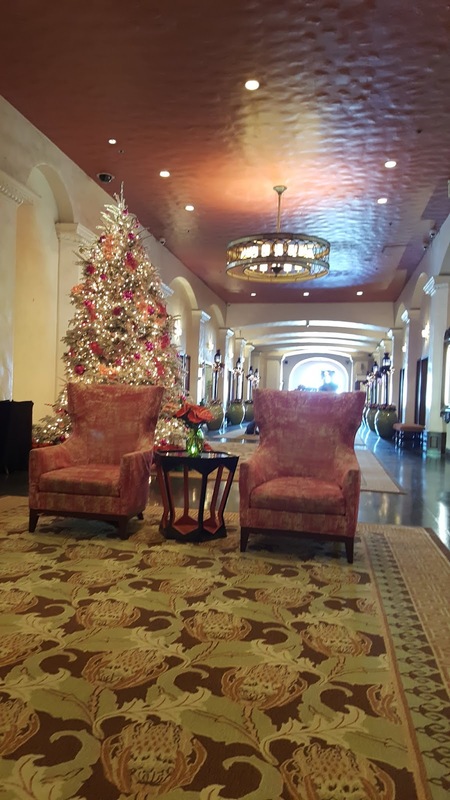 I envisioned men from the army, navy and marines wandering through the grounds, pausing for a time in the foyer, admiring the Christmas decorations. My mind's eye spied 1940s vacation wear. 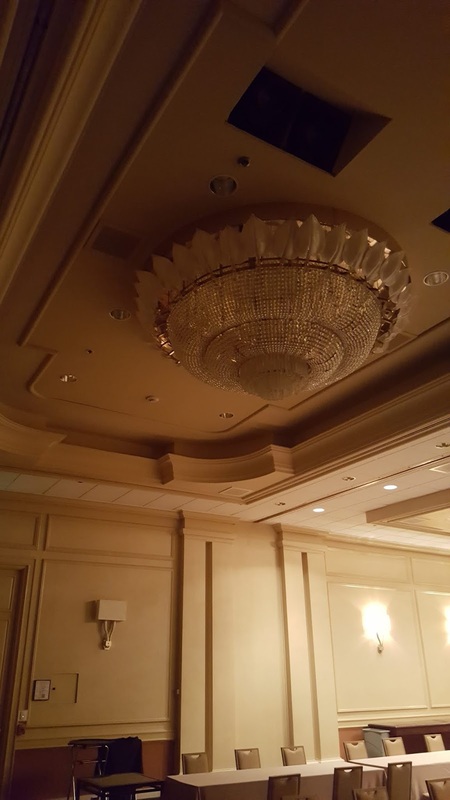 My ears perked to big band swing tunes wafting from the Regency. The social repartee, the comportment of the military and general public alike- supremely civil. For a moment I looked down at my casual dress and felt out of place in my own imaginings. Like a stalker, I followed my men out to the beach, a sparkling ever moving turquoise-blue ocean that with each incoming wave threw more of the coral specks on shore - an orange-pink-sand hue, rough, round and jagged beads of calcified sea life that when examined each held tiny worlds within. the beach goers and witness the sunset. 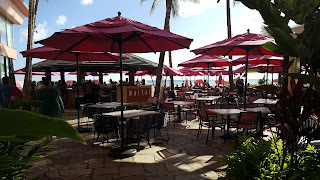 The Mai Tai id a lovely casual out door lounge facing Waikiki. As I sat under the shade of a rich red patio umbrella, on Waikiki, sunbathers, young and old, relaxed under umbrellas of their very own, splayed out on chaise lounges. The scent of sea water, rum and coconut oil mingled and attacked my senses. I was truly beginning to see my story unfold. I had feared that maybe this research trip would prove that everything I had envisioned for AIR would be dead wrong. I was happily proven wrong. All was as I had dreamed. My mind's eyes observed the past surrounds, those precious hours of life for servicemen before death took hold. 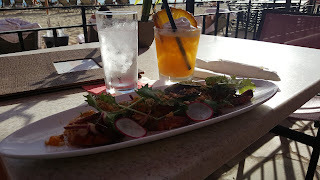 I ordered the most expensive cocktail at the lounge - a $35 American dollar Mai Tai. Its main ingredient: 3 decades old aged rum. Although smooth and rich as royal silk, I should have ordered cheap bourbon and ginger ale and drank like my sailors. It would have tasted more satisfying. 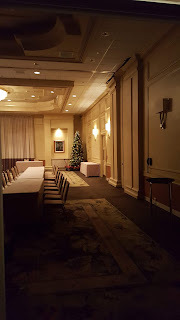 The afternoon wound down with meeting new friends at the Mai Tai - Dennis & Tara from Oregon - and Dennis's pervasiveness with Dana, our lovely and very obliging server, to talk it up to the hotel's chain of command for me to get a look at the locked Regency ballroom. Dennis, an avid WWII historian himself, happens to be a "fence-jumper" like myself - a term I coined to describe someone who will go to almost any lengths to get across the proverbial red velvet rope to get that rare insight into history. We were not disappointed. 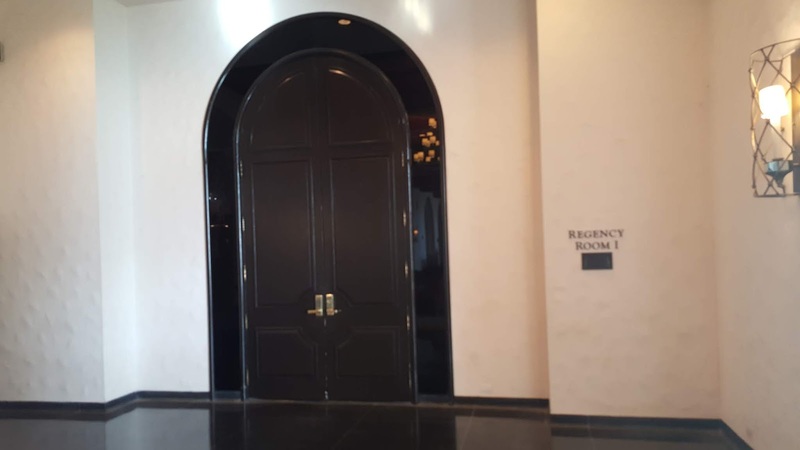 The doors themselves were solid wood and over 4 inches thick, but opened as if on greased rails to Heaven, slow, smooth and reverently silent. Inside, history still breathed! 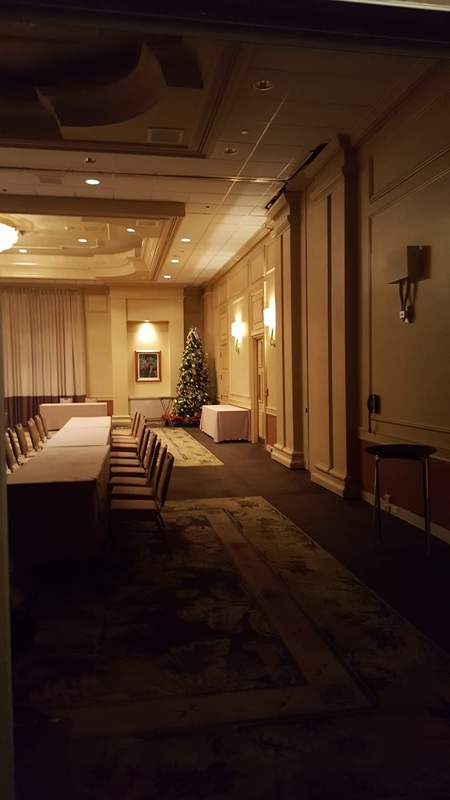 Although the flooring that surely in '41 would have been inlaid parquet wood was now covered in thick broadloom, the crown moulding, the floor boards and the crystal chandeliers were breath-taking. My minds eye didn't have to work hard at all to see the ballroom as it was - so huge it was now divided into three conference rooms - chock-a-block full of navy officer dress whites and fine floral frocks while Benny Goodman and Harry James tunes rang out from the orchestra. It was a glorious sight before me. A Cinderella night in paradise. One could see how the looming black clouds of war could be so easily ignored on such a wondrous isle. How could enemies exist? Why would anyone want to break this picturesque bubble? How could those gentle breezes and the languid waves carry blood, death and destruction? My rental car, parked in the US Postal Office parking lot on Saratoga Street, was running out of time. Reality was breaking through. I bid farewell to Dennis and Tara and left my boys to frolic on Waikiki. I did not want to rush them into tomorrow. Tomorrow would come soon enough. They had until midnight to get back to the Okie. Let them live every single minute. I put my Nissan into gear and headed back to Ewa. As darkness overtook the freeways and lights whizzed by, my emotions were a whirling mix of joy and dread. Oh, to see into the past and know how it plays out. It is a wholly unsettling nature. 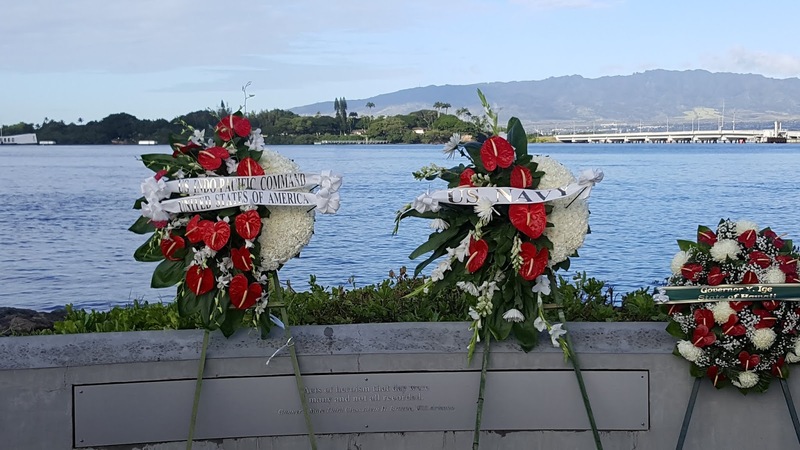 4:30 a.m. is a strange time to rise in paradise, but that was my reveille on December 7th, 2018. 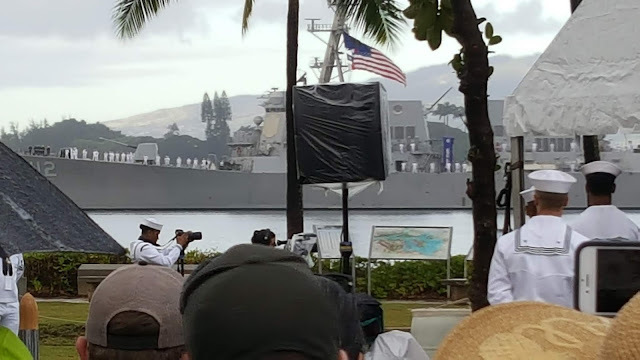 This, for me, was the darkness before the dawn of infamy, 77 years hence, and I was here in Oahu to witness this very moment as background fodder for my upcoming Pearl Harbor epic, AIR. The line started forming well before I arrived at the memorial park on a drizzly but humid and warm pre-dawn. 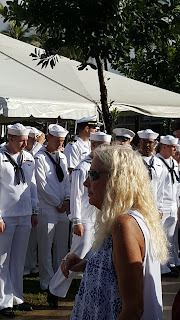 To see navy men and women in their dress whites was so striking to me. Lower rank army and navy service men and women saluted the higher ranks, making it seem as if 3/4s of a century hadn't floated by since that fateful day. 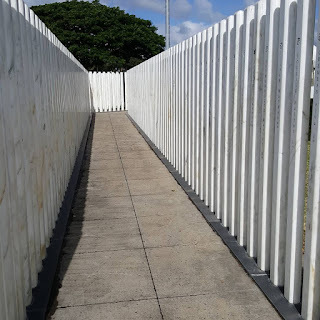 I had dressed as appropriately as I could for tropical weather - a navy blue blouse and white Bermuda shorts - and in the only way I knew how, silently paying tribute to the past. I felt as an intruder on these hallowed grounds, yet, Pearl is still very much a working navy base amid the dead. 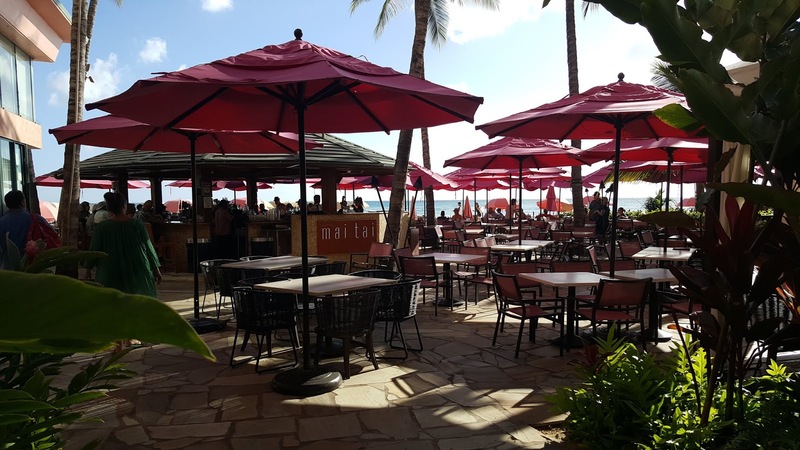 All the tourists lining up around me weren't dressed that much different; an Hawaiian shirt here, a sun dress there, but what we had in common amid the relaxed atmosphere was a subdued presence. As if by historical knowledge or by instinct, all knew this was no Disneyland theme park we were entering. My nerves were on edge. The lack of sleep the night before was quickly forgotten. My being a mix of anticipation, deep sorrow and an odd dash of survivor's guilt, irrespective of the fact that my own birth wasn't until 24 years later. I could sense "they" were watching us. But unseen eyes were watching. There was no doubt about it. The atmosphere that drizzly, dark morning didn't feel morose or depressing. It felt calm and reverent, akin to visit a grave yet heavier, more claustrophobic. A sense of not being able to breathe. It was a trick of the mind. I was drowning on dry land. 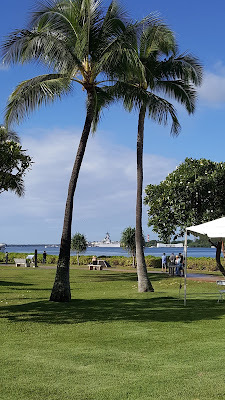 As I looked out into the harbor and caught my first up-close glimpse of the Arizona memorial and the USS Missouri birthed where my beloved Oklahoma had lain, time stood still then catapulted me back. For a few seconds, it was no fantasy. I could not breathe. My eyes clamped down hard on history. The sight was so great to me I enabled no organized thoughts. 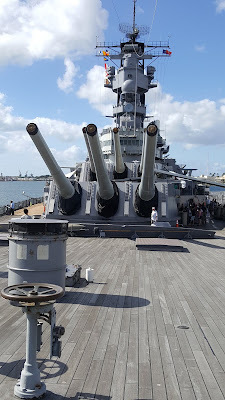 I looked skyward and tried to imagine the Japanese Kates and Zeros with their bombs and torpedoes zeroing in on battleship row... those eight great girls, those mighty dreadnoughts, my men and my Okie... the explosions, the water eruptions, the blood red mist, the screaming, and the fires. Alas, at 6 a.m. on December 7, 2018, here in present day, there was only an empty overcast sky hovering over a calm sea, the harbor vacant of burning wreckage and broken bodies. Once cognizance returned, the one thing that was made abundantly clear was how much of a goldfish bowl Pearl Harbor actually is. Television documentaries don't do the harbor justice. Geography is warped, stretched, having the viewer think it's an expansive, flat cove when it's anything but. 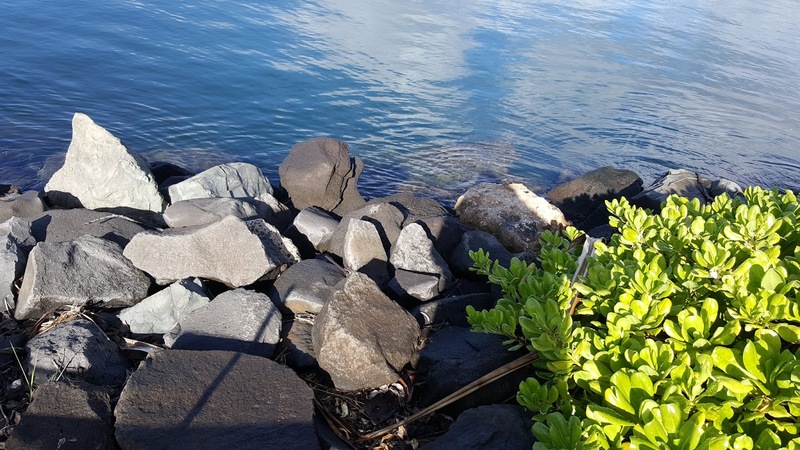 To drive down to the harbor from the H1 freeway, you are forced through a dizzying array of lefts and rights as a kind of subtle switchback to get to the water level. My first "Monday morning quarterback" thought was to chastise President Roosevelt. 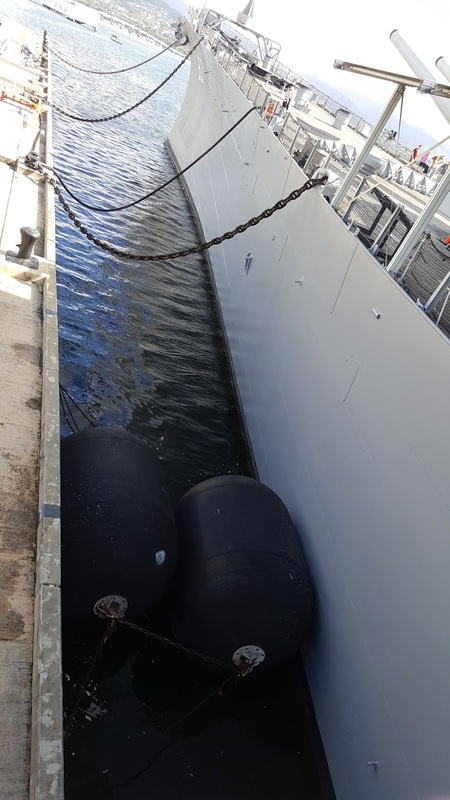 What the heck was he thinking forcing his entire Pacific fleet into this floating sardine tin can? Mountains to the north so you can't see what, or who, is coming. That oh, so narrow channel, the ships only way of escape. Sitting in my white lawn chair amid the pelting rain, I felt vulnerable, caught, like that goldfish in that bowl. All unseen enemy eyes glaring down on me, targeting me, readying me for the kill. I know I have no right to second guess dead souls 77 years later, but if you look up and around all you feel is hemmed in as a floating turkey in a turkey shoot waiting for the projectiles to strike. The ceremony began at the moment the attack began - 7:50 a.m. - with a minute of silence. But in my writer's mind there was anything but. My eyes were closed but my ears were flooded with painful, terrifying sounds; my nose drowning in god awful smells of sea water, bunker oil, burning flesh and spent cordite. I tried to remain in 2018 but my mind refused to retreat from '41. My soul wanted, needed to be "there," even if there was just so bloody gut-wrenchingly, nauseatingly awful. For that minute, there was Hell. For one second beyond that minute, I was cannonaded back and a serene stillness laid upon me like a heavy farmhouse quilt. Their "eyes" returned, warm and inviting again. The horror had washed away as sins are washed away in a baptismal font. The dead were long ago freed and we living witnesses on this Friday morn were taught a lesson, and thereto freed. Young and old, rich and poor, weak and powerful, we all stood in awe and breathed the same air, the pure distilled essence of freedom. The 199th and the 19th Fighter Squadrons of the Hawaii National Guard and the U.S. Air Force respectively did the "Missing man" flyover in F22s. The USS Michael Murphy did a Pass-In-Review in the harbor, and when that destroyer silently floated by battleship row in front of us with all aboard in their dress whites saluting towards the memorial, my ability to cordon emotion was all lost at sea. A slow and steady stream of tears flowed as I gulped the air, futilely trying to regain some self control. I don't think as long as I live I will experience such overwhelming sorrow and astronomical pride. 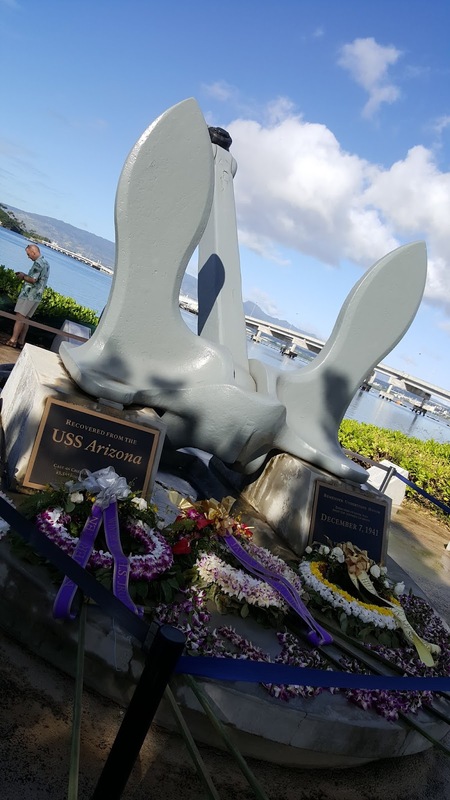 Pearl Harbor is not a national tragedy. 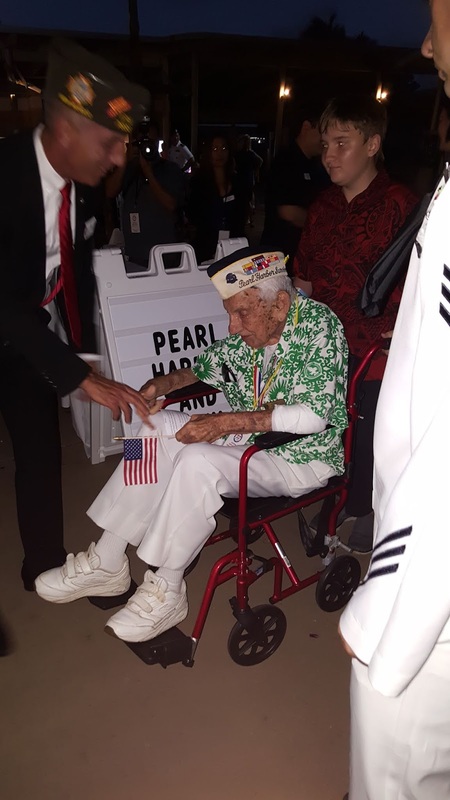 Pearl Harbor is the scar all freedom loving citizens of this world wear. Tears are rolling down my cheeks as I type this, and remember. 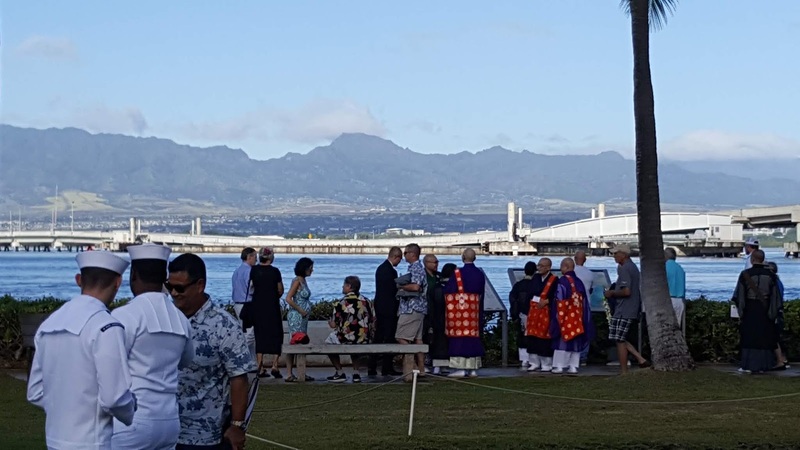 Speeches were given by representatives of the National Park Service, by the Rear Admiral and Admiral of the U.S. Navy and a prayer for peace was offered by the reverend of the Japanese Religious Committee for World Federation. 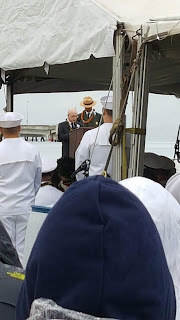 Colors were presented and wreaths were offered by all the battleship associations, the US Navy, and the Parks Service. All the Pearl Harbor survivors who could make the journey were asked by the Admiral to "stand as able" and receive our applause. Those few and frail men and women stood as able as if they were 21 again and this was 1941. The pride and determination on their faces made me think that if they could they would follow the Admiral back into battle that very minute. 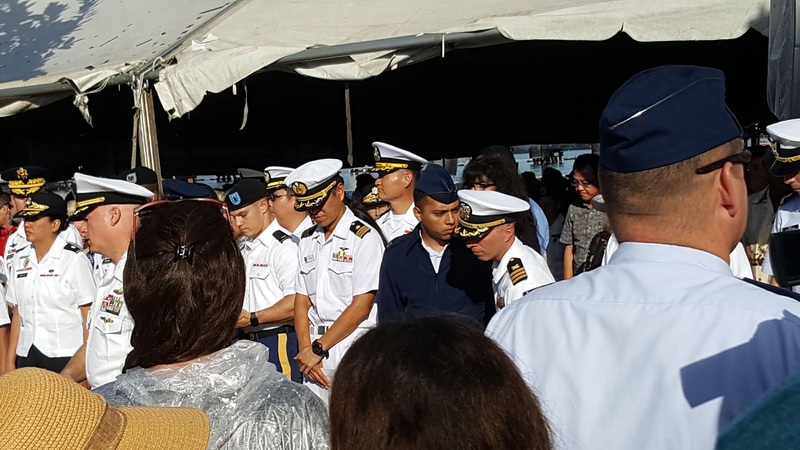 Having witnessed such devotion to service, it's no wonder that many survivors who eventually pass on want to be buried back with their buddies in Pearl. 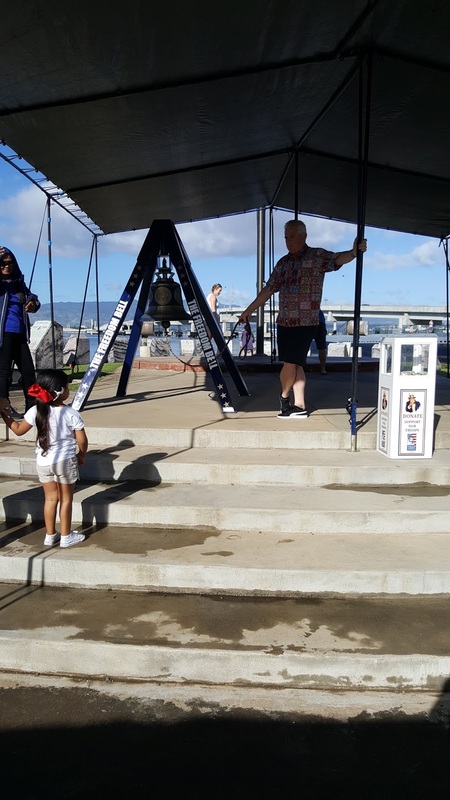 An Hawaiian blessing was cast upon the harbor, a Navy benediction, and a rifle salute facing the harbor proceeded Echo Taps and the Postlude. 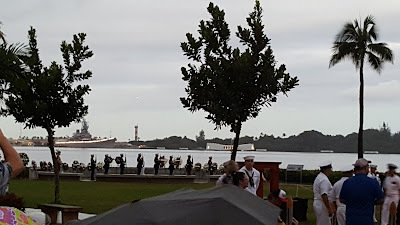 A vintage aircraft flyover and a tugboat water tribute closed the ceremony whereby all ranks lined up next to where I had been sitting where an honor guard parade formed to salute the exiting survivors. Those aged men and women, most now in their 90s, their eyes glowed with pride. Some of the vets stopped to thank their fellow men and women in uniform and both, past and present, shared an intimate moment of "knowing." Again, for me, the tears flowed and the air gulping returned. I was taught by my RCMP father decades ago that we Thompson's never cry in public, but if he had been by my side that day (he would be 104 in 2018 if still alive), I dare say tears would have wet his cheeks. At ceremony's end, I felt, as I'm sure many there did, a kind of personal baptism. To be there, to experience the ceremony, to breathe that hallowed air, you come out the other side cleansed, calm, and uplifted. It was as a verification to me that life's torch does pass, that souls live, die and are reborn. I am bereft to remember a more faith-heavy experience in all my days. It gave me a renewed optimism for mankind, a deeper love for our dear blue planet and a strengthened belief in God's plan for us all in this wondrous universe. 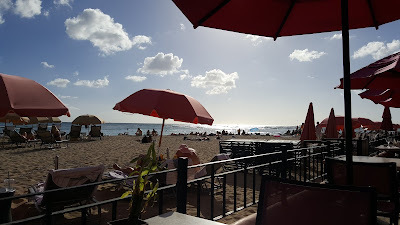 This was only my third research day on Oahu. Did my mind and heart have room for more? 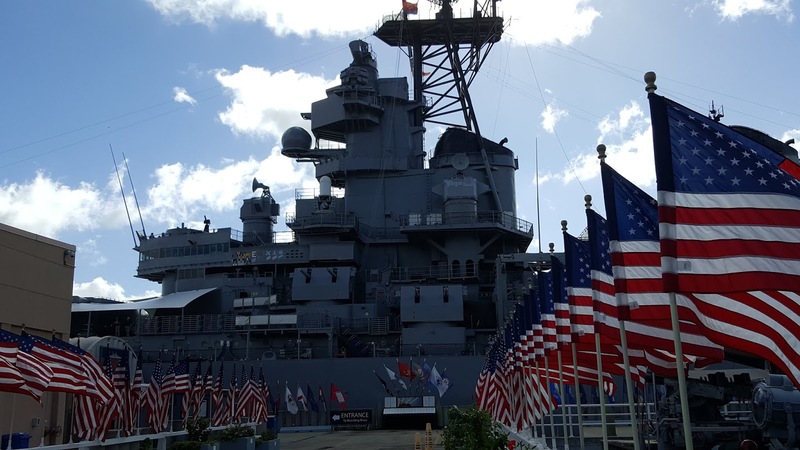 After the Pearl Harbor ceremony, I walked the grounds of the Visitor Centre before making my way to the Missouri. 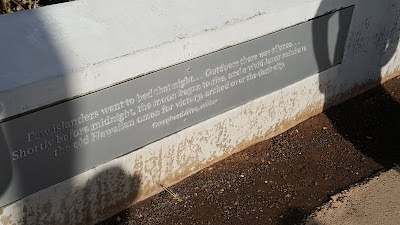 "Few islanders went to bed that night... Outdoors there was silence... Shortly before midnight, the moon began to rise, and a vivid lunar rainbow, the old Hawaiian omen for victory, arched over the dark city." I'm sure that night most would have assumed the victory was "theirs," the Japanese, but the Big Picture only God can see spoke different. It's always darkest before the dawn. In my belief, it was a whisper of assurance that despite the immense tragedy, that from the blood and ashes a birth of permanent peace. The volcano, bursting at the seams of feared war, had finally blown, the pressure released. It would take four more years and thousands more sacrificed but a permanent peace would be had, putting right that old Hawaiian omen. urge, as I'm sure all tourists felt, was to touch the base. I looked, I hesitated, then I chose not to touch it. Something told me I wasn't worthy. Something, or someone, whispered, "No. If you have not walked in my shoes, you should not touch." Several around me touched and I watched them do so. I allowed my emotions to billow up, I digested them, then I whispered a goodbye, and walked on. The Centre is situated on a rectangular jut into the harbor so the sea and the shore rocks followed you all the way. The shore, however, is fenced off, no doubt to protect tourists from falling into the water... but it saddened me. I wanted to touch the water, have my skin stained with the past, feel the infinitesimal bunker oil residue on my skin... in my own way, touch the dead. You could argue the dichotomy, and ask, "Why feel entitled to touch the water and not the steel?" I have no good answer. Maybe reverberations live in the steel, and escape from death comes from the sea. I truly have no reason. It was moot, of course. The entire time I was at Pearl I was unable to touch the sea water. It made me feel detached from the dead, but then again, how much right do I have to be attached? Maybe there must be an invisible line - the living vs. the dead - but it saddened me, all the same. 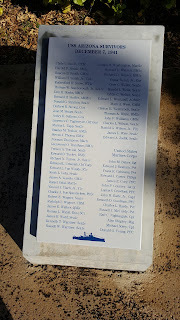 Next up was a list of Arizona's survivors and I recognized several on that plaque as authors of books I have read. It felt reassuring to seem them listed there. surprising thing to me that anyone could ring it. As I stood to the side a couple little kiddies rang it knowing not what it stood for, but even their wee souls sensed something grand about the act as their body language and expressions gave away. I often think children sense more than adults do. No, I did not ring it. And no, I'm anything but shy. Again, I felt it wasn't my place. There would be many times on this 11-hour day that I felt unworthy but I stayed and I learned and I listened. I knew my place was to mentally record. 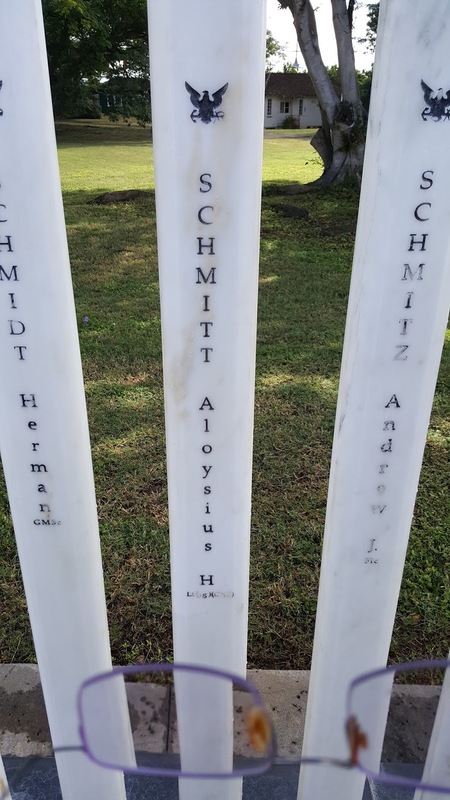 As my boys did their job on December 7, 1941, I was doing mine on December 7, 2018. 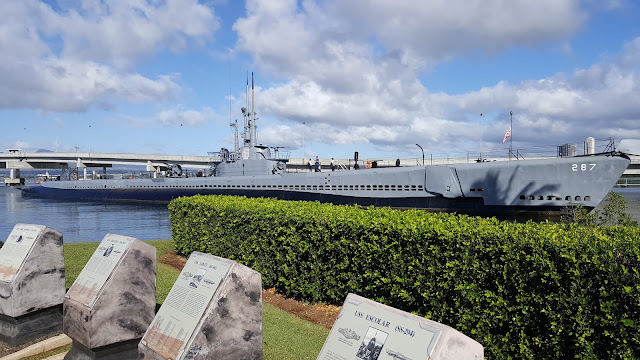 I glimpsed the submarine Bowfin from a distance and various missiles and an aircraft outside the Bowfin tour. My time was short so sub touring I did not do. 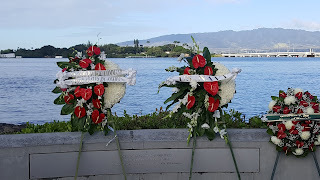 I took one final look at the harbor before heading to the tour bus to take me over to Ford Island. This photo should be etched with my longing to stay and sit and breathe in forever my surroundings. The overcast and battleship grey sky which had opened up on us and remained the entire ceremony, managing to soak everything on my person, had evaporated, inviting the crystal clear surrounds you see in this photo. My top and shorts and soggy program were slowly drying out in the toasty warm sun but I didn't care. There's something about being on Oahu. Upon even viewing the island from a plane it's as if ancient Hawaiian spirits remove all unimportant stresses from your soul and you float about zeroed in on only what matters in life. My mind was laser focused. My body was unimportant. I was as a ghost flitting to and fro from '41 to '18, wet or dry. Next stop: meeting my dead guys on their ghost ship. On the bus going over, there was only one question bobbing up and down on my mind, How do I survive this meeting? 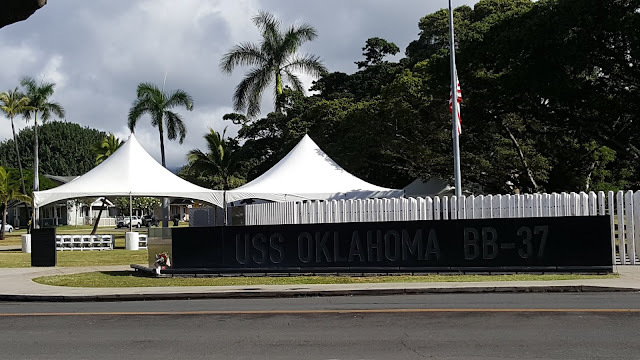 The second half of my day at harbor on the 77th anniversary, December 7, 2018, began with the most solemn task I would undertake at Pearl... visiting the USS Oklahoma memorial located on Ford Island about 200 feet inland from the water's edge and the USS Missouri which is docked where the Okie lay capsized all those seven plus decades ago. I disembarked with other tourists off a designated memorial bus as no one can enter onto Ford Island any other way. It is still a live naval base. 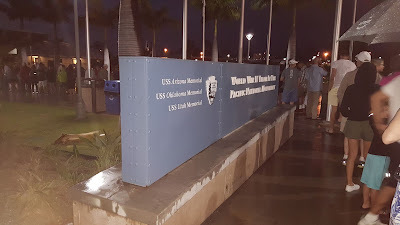 Everyone but me scurried onto the Missouri while I asked a security guard at the gate if I could walk back to the Okie memorial, and he said yes. He watched me for a time, making sure that was my intention. Eyes are definitely on you on Ford. There had been a ceremony earlier that I had missed but in a way I was glad no one was around. I'm greedy. I wanted my boys all to myself. 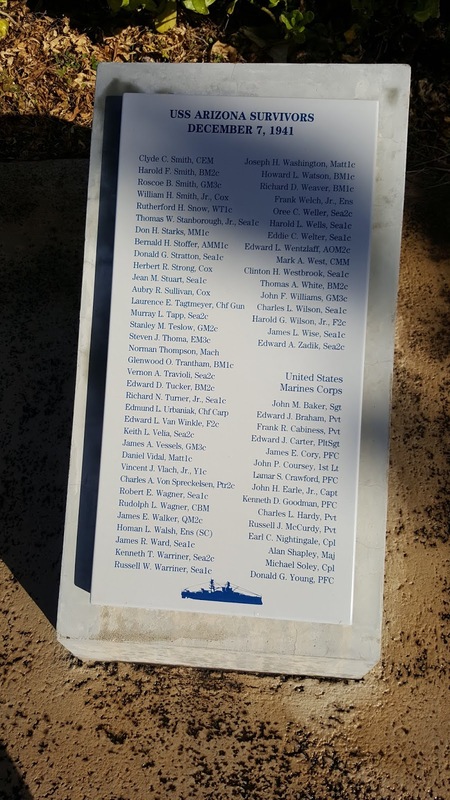 The memorial consists of a massive black granite sign with the Okie's number, B37, the slab representative of the battleship itself, and behind, rows of white marble stanchions, representing each and every sailor that died on board that fateful day, some 429, all in the dress white crackerjacks at eternal attention on deck. The number of stanchions takes your breath away. I didn't know where to begin. 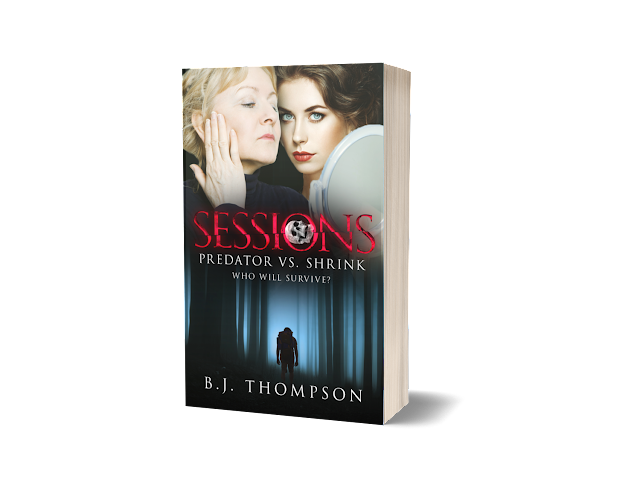 As a former life guard, there was a fantastical microsecond where I wanted to jump into the fray, gather them all up and drag them to shore. All these men, all my boys, they couldn't be dead. They just couldn't. It was hard to take. The tears welled up. I gulped back the emotion and walked in. 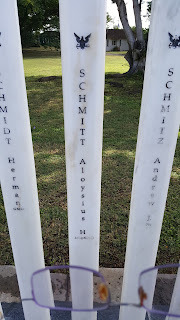 I looked at each and every stanchion and read their names and touched most of them. I felt unseen eyes on me the entire time... their stares were a mix of welcoming warmth and confusion as to why I was there. Some I could sense were the jokers of the group for they'd spit out playful quips . Others called out to me that I looked like their mom...lol... None cat-called or whistled, but I felt a few sets of eyes warmly look my way. I knew at age 54 I was not the gal of their dreams, and it was alright with me to be their mom. They were my boys after all and they'd stay my boys. As I'd walk down the rows, a few in my mind's eye looked scared and were shaking. They would whisper, "I don't like water. I don't like water." It had rained earlier that morning and I knew what they wanted me to do. I lovingly wiped down their stanchion and I whispered back, "It's okay. You're okay. You're dry now." I can only assume those boys were the ones who drowned and even rain water frightened them. I came across many who I knew from reading books about the Okie. The entire ship's band was there. The group were at the jackstaff that morning, preparing for 8 a.m. colors and they all perished. port hole but helped others escape before he himself drowned. I wiped his stanchion down, too, leaned my forehead to touch his name and he and I said the Lord's Prayer. 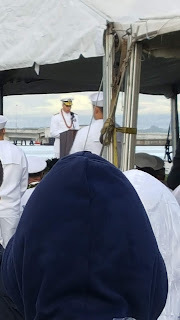 I felt the other sailors around us bow their heads and pray along. For a time, the world was still and all 430 of us were as one. From this moment on, I knew we would never be truly apart again. Visiting that memorial was so hard on me. I think back at it now and the tears flow. 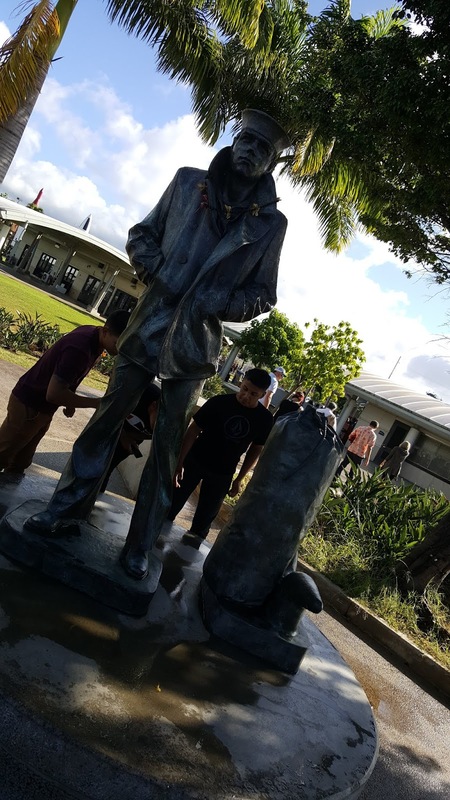 Pearl Harbor, although beautiful, is thick with sorrow. It's evident in the water and on land... if you are still with your thoughts and carefully listen and look. The immensity of the loss actually weighs heavy on your body. You FEEL the weight of all of those dead men, 2,335 killed in all that day. 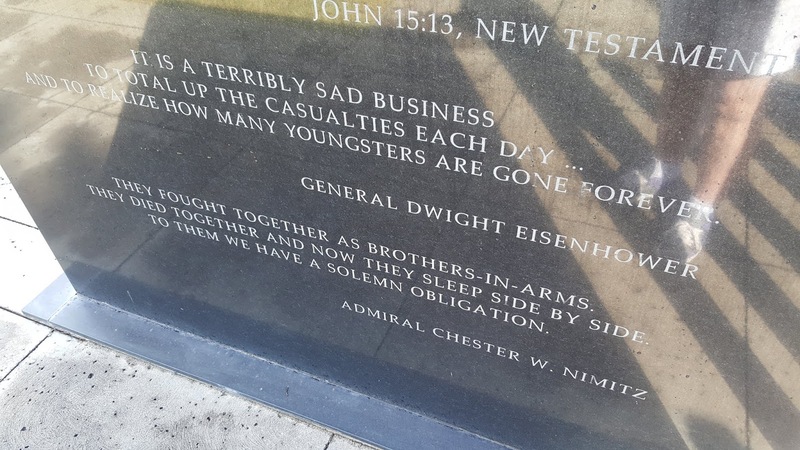 It was not lost on General Eisenhower nor on Admiral Nimitz by their comments engraved at the site. It's a beautiful memorial but it utterly breaks your heart. Once I left the USS Oklahoma Memorial on Ford Island, I headed for the USS Missouri, and it felt as if the entire ghost sailor contingent of the Okie were watching me board. I hated leaving the Okie Memorial and my boys but my book centres so much inside the battleship I had to get in there and see and touch and smell and hear as much as was humanly possible. Before you enter the dock, you're greeted by a statue of Admiral Nimitz, and his comments below say all that need be said. I cannot imagine what it was like on that fateful day in December '41 to be in charge of men who perished in an instant, and by the hundreds. I've started to analyze all the signatures of most of the admirals and generals in WWII, and so many end their last name with a straight line. I think that's key. Warriors, their very reason for being, is to charge forward at all costs. That doesn't mean they don't have hearts and are not affected until their own deaths by hauntings from the dead, as I believe they are, especially after the war ends, but men like Kimmel, Nimitz, Halsey, they knew they had to win that war to literally preserve our freedom. WWII was not a political war or a phony war. Real dictators were edging closer to our shores. It was up to a handful of men to break us free of that dreadful assault. 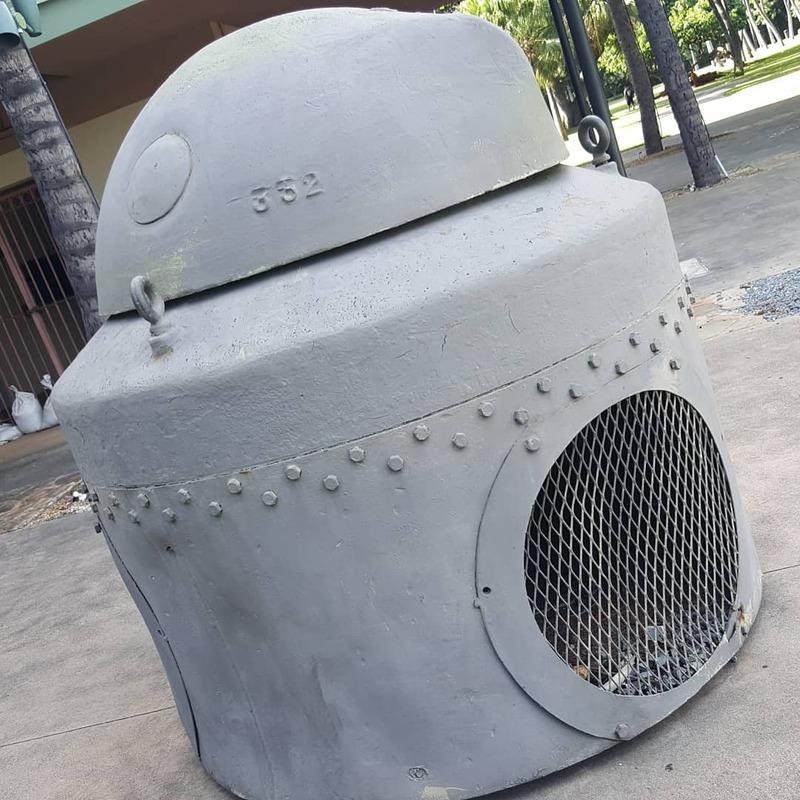 I looked down and saw the two huge buoys which protected the Mighty Mo from the water's edge and it flashed to me the burned men wading in that water, desperately trying to board the USS Maryland that was inboard of the capsized Okie on December 7th. Bunker oil in some places a foot think on the water, igniting the sea in flame... body limbs and decapitated heads and blood and flotsam of all kinds that made swimming through the liquid muck virtually impossible, and if by some miracle they found a rope to board or a helping hand to cling to, the oily and burnt skin made climbing or being hauled up another level of impossible. Looking down, my mind's eye heard the screaming and yelling and the AA fire and the Japanese Kates and Zeros zooming by. I smelled the burning stench. I saw the whites of mens' eyes, frightened, desperate, dying. For a second I imagined they were looking straight at me for help. I shivered in the hot sun and removed my eyes from those buoys. There's only so much I can do for these long dead men. second thing that shocks you is the smallness of this floating world. Battleships of any country back then when you set them up against the high seas look as bobbing bathtub toys. 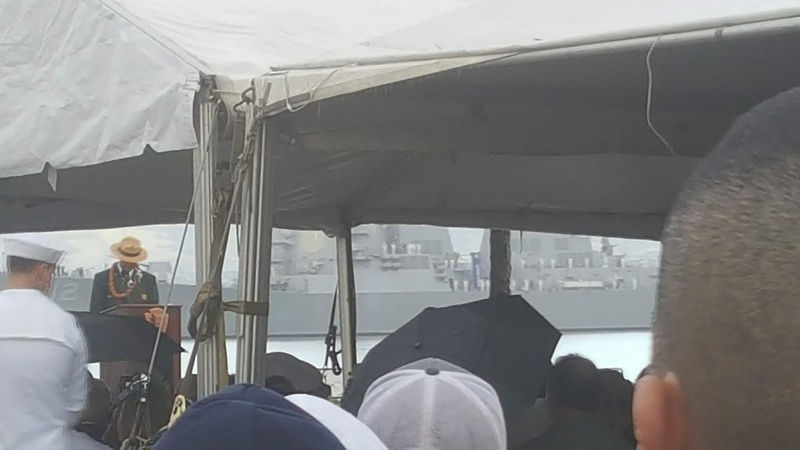 You wonder how any of them fought and survived Mother Nature's Pacific ocean whims of typhoons, much less enemy fire. The decking was absolutely marvellous. Well cared for aged teak, greying in the sun. I reached down to touch. It was silk. 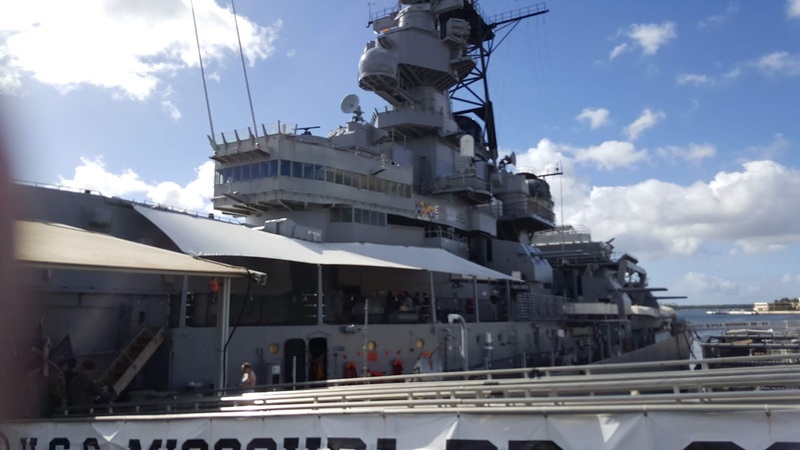 As I walked the length of the Mo, not a notch or splinter or rough patch was to be had on that deck. Truly magnificent. The jackstaff caught me unawares. Another mind's eye moment. I saw ghostly imagines of the Okie's band and officers all in dress whites about to raise colours at 0800. I could hear the anthem being played. I could see the bright healthy faces of these oh, so young men, and I could see the flags being raised. 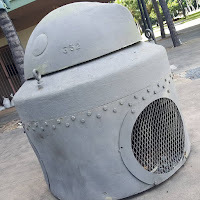 An imaginary bomb burst on the south end of Ford Island shocks me out of my daydream and my body jerks. Visiting the Missouri had me bob and weave out of the present and into the past all afternoon long. Very disconcerting. Very dizzying. Very emotional. 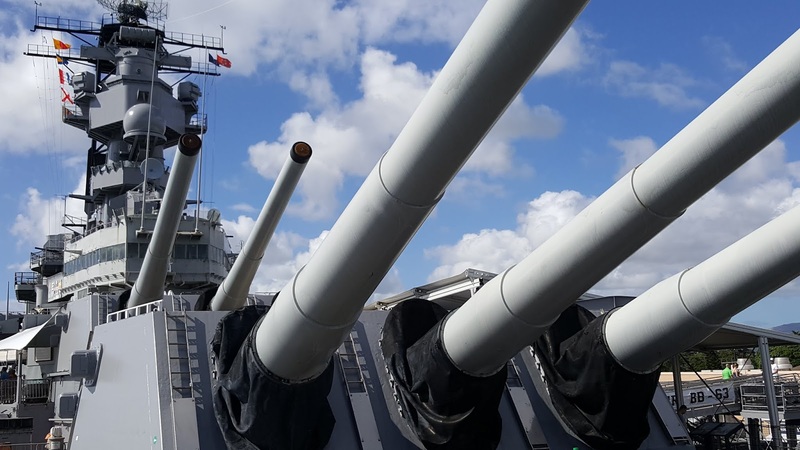 The third thing you notice on the Mighty Mo are the big 16 guns that would have been 14 inch on the Oklahoma. They loom over you like a spectre of another time and place, their barrels corked in peace. You didn't have to think twice that at a moment's notice, those corks could be removed again in war. Peace is a costly luxury we all have to work to preserve each and every day. That's the sole thought which comes to me as I gaze upward, and shudder. When those guns are fired, no sailor can be outside to watch. 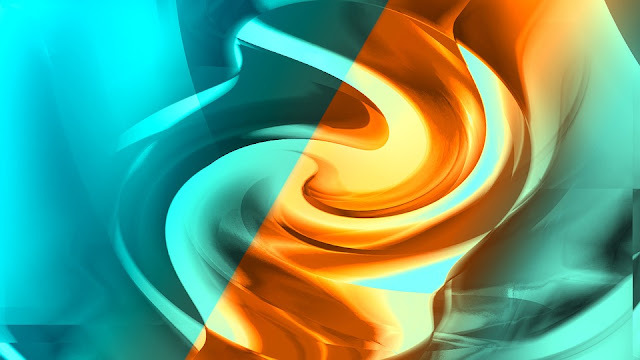 The explosive force and the ensuing shock wave could kill a man. I went up to touch the huge leather combing around the base of the guns. Although aging, the material was still supple and smooth. 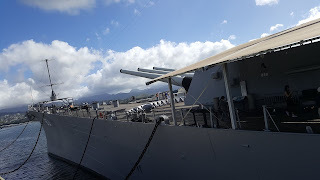 It was very difficult to imagine those guns firing. I believe that's another one of the many experiences of a sailor's life we civilians can never quite appreciate. I stood still under the guns and breathed in the salty sea air and tried to become one with the present and the past. The single shocking feeling that came exploding into my mind is that military service, defence, and war are a young person's game. Standing in that moment at the age of 54, I felt old and weak... a feeling not normally at home with my psyche, but I did. I would be the age of these boys' parents or maybe even their grandparents. I had no right to be in this ship. It would be me who would say goodbye to my children or grand. 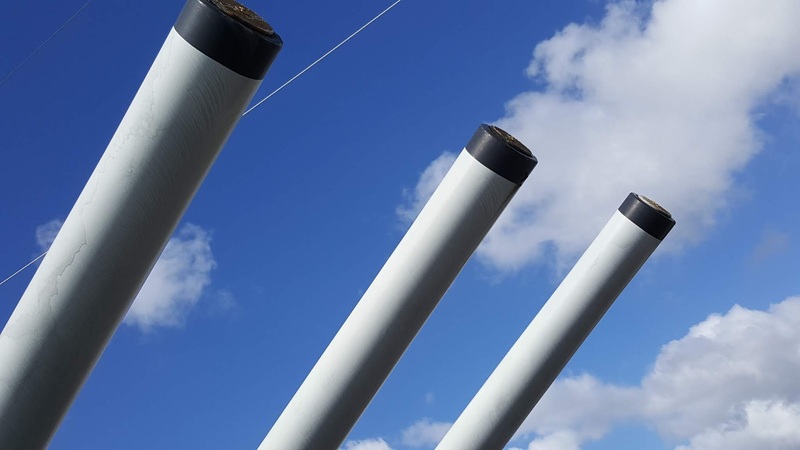 It would be me tearing up at the dock in Bremerton or San Diego or Long Beach, waving goodbye, white handkerchief in hand wet from those tears. And it would be me, hearing a knock on my door and receiving a Western Union telegram from the US Navy that my son or daughter would never come home. That thought, under the welcomed shade of those big guns, made me cry and shiver. I truly wondered what right I had to be wandering on this warrior class deck.